Department Of Justice Report Finds Conditions In Alabama Prisons Unsafe A civil rights investigation into the Alabama prison system by the Department of Justice finds conditions unsafe and unconstitutional. Violence, understaffing and crowding are common. The U.S. Department of Justice says conditions in Alabama prisons are unsafe and unconstitutional. The findings are the result of a more than two year civil rights investigation prompted by spiraling violence in Alabama lockups that has resulted in deadly harm. The Justice Department report finds that Alabama routinely violates the constitutional rights of prisoners by failing to protect them from prisoner-on-prisoner violence and sexual abuse. It notes "a high level of violence that is too common, cruel, of an unusual nature, and pervasive." "Our investigation revealed that an excessive amount of violence, sexual abuse, and prisoner deaths occur within Alabama's prisons on a regular basis," wrote Assistant Attorney General Eric S. Dreiband, and the three U.S. Attorneys in Alabama in a letter accompanying the report sent to Republican Governor Kay Ivey. The detailed report outlines cases of inmate deaths, rapes, extortion of the families of prisoners, and rampant contraband weapons and drugs. It says facilities violate the constitution, by not providing "adequate humane conditions of confinement." "I wish I could say it's surprising but it's not," says Republican State Senator Cam Ward, chairman of Alabama's prison oversight committee. "It highlights some very serious concerns with regard to inmate-on-inmate violence, the conditions of the facilities, and ... what DOJ expects from us, which is, within 49 days, to come up with a plan of action on how to deal with some of these problems," Ward says. It's such a damning portrait of a system in crisis. Lisa Graybill, Southern Poverty Law Center. 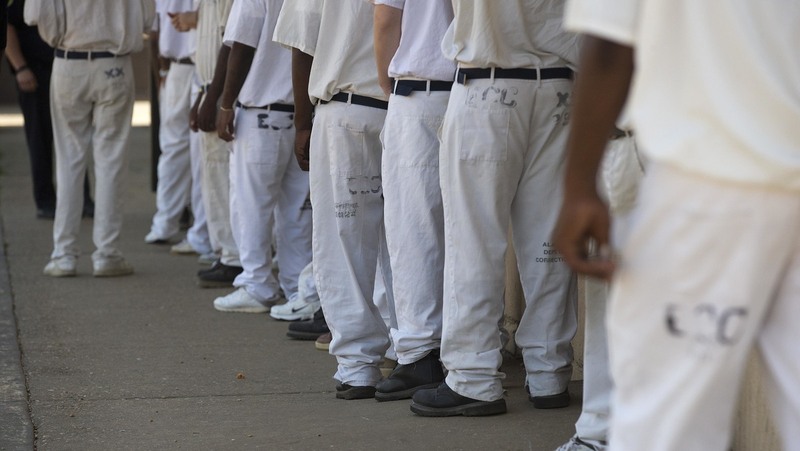 Alabama's prison system is in crisis due to chronic overcrowding and severe understaffing. For example, the warden at Alabama's Holman prison, that houses death row, reported to DOJ investigators that she estimates that she has 11 security staff per shift for a prison population of 800. The Justice Department also found evidence that some officials at the Alabama Department of Corrections (ALDOC) are "deliberately indifferent to the risk of harm." It says the state has been aware of these issues dating to the 1970s, "yet little has changed." "It's such a damning portrait of a system in crisis," says Lisa Graybill, deputy legal director for criminal justice reform at the Southern Poverty Law Center. The group sued on behalf of inmates over the lack of medical and mental healthcare in prisons. A federal judge has found "horrendously inadequate" mental healthcare and is holding hearings to force the state to stop a rash of inmate suicides. Graybill says today's report from the justice department corroborates what civil rights groups have argued for years. "The state has refused to accept responsibility for bringing its population down to a manageable level or bringing its conditions up to a constitutional level," Graybill says. Now the federal government is threatening to sue if Alabama doesn't comply with specific remedies set out in today's report. The state is already operating its women's prison system under an agreement with the federal government to protect female inmates from staff sexual abuse. State officials say they are aware of the problems and are working on reforms. "In response to DOJ's findings, it is important to understand all the current efforts ADOC has taken and will continue to take to improve the conditions of confinement within the male prison system," Alabama Corrections Commissioner Jeff Dunn said in a statement, citing plans to build new prisons and secure additional funding from the state legislature. "Our primary objective is to ensure each facility provides a humane, secure, and safe environment for inmates, and that reforms already in place and proposed bring about positive, tangible changes throughout the prison system," Dunn said. The legislature has eased sentencing guidelines for non-violent offenders in recent years, and allocated more money for prison guards. State Senator Ward says lawmakers are the considering even more this year. But he says it's not politically popular given all the demands on state government. "It's not something that your constituents call and say 'Hey let's fix the prisons' so it has to be a last priority behind schools, your health care system, etc.," says Ward. "I think this is pretty much in line with other states, we've just let it go for so long we've got to finally you know call to action." Governor Kay Ivey said in a statement that her administration will be working closely with DOJ "to ensure that our mutual concerns are addressed" and to make certain that "this Alabama problem has an Alabama solution."